The third Panoz Esperante GTR-1 built, this car was one of a pair fielded by David Price Racing. It debuted with an 11th place finish in the FIA GT race at Hockenheim and was subsequently entered at Le Mans. Starting 32nd, it failed to reach the finish due to an engine issue. Chassis 003 continued to be raced in the FIA GT Championship with ninth place finishes at Spa and Donnington as the joint best results. At the end of the 1997 the car was mothballed but this was not the end of its contemporary racing career. 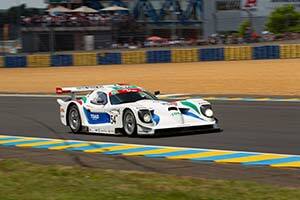 Late in 2003, it reappeared in the Le Mans 1000 km race, now fielded in the GTP category. The following year, it raced at Sebring, Le Mans and Spa with a ninth at Sebring as the best result. By 2018, it was back in action, running in the Global Endurance Legends sessions at the Le Mans Classic. First owner Panoz Auto Development Co.